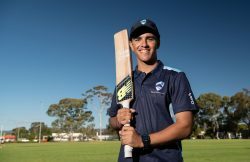 NSW Metro captain teenager Oliver Davies has shattered records after smashing six sixes in an over on the way to an extraordinary double-century on the opening day of the Under-19 National Championships in Adelaide. After reaching his century off 74 deliveries, the 18-year-old – who idolises Test batter Shaun Marsh – unleashed, taking just 39 more balls to get to his double-ton. That blitz included one of cricket’s rarest feats – a perfect 36-run over; Davies took aim at off-spinner Jack James and sent all six balls of the 40th over of the innings over the rope. It was the most runs ever taken from a single over in the history of the U19 Championships. “After the first two sixes I had it in the back of my head I wanted to give it a crack and it paid off at the end,” said Davies, NSW Metro’s captain. The Blues went onto win the match by 168 runs, with Davies collecting a wicket as the NT were dismissed for 238 in the final over. The most sixes ever struck by a single batter in an international 50-over game is 16 – a record shared by Rohit Sharma, AB de Villiers and Chris Gayle – while Sir Garfield Sobers, Herschelle Gibbs and Yuvraj Singh are among the few players to have struck six sixes in an over. Davies’ knock was also the first one-day double-century ever scored in the U19 competition and the first across all formats since Jason Krejza scored one in 2001-02. He also cracked 14 fours in his 143-minute blitz as he shared a 271-run second-wicket stand with Samuel Fanning 99 off 109 balls to see his side rack up 4-406 from their 50 overs.